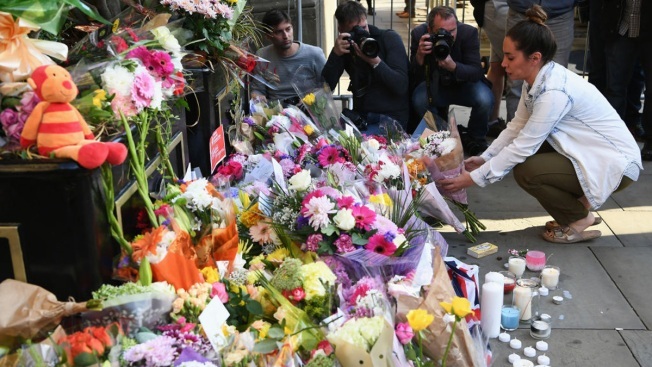 "I never expected that I would be treating patients who have the same injuries that I saw in Syria"
In this file photo, a member of the public lays flowers at a candlelit vigil, to honor the victims of Monday evening's terror attack, at Albert Square on May 23, 2017 in Manchester, England. Monday's explosion occurred at Manchester Arena as concert goers were leaving the venue after Ariana Grande had just finished performing. Greater Manchester Police are treating the explosion as a terrorist attack and have confirmed 22 fatalities and 59 injured. After a brutal suicide bombing that left 22 dead and dozens injured Monday night by the entrance of a Manchester arena in the U.K., a local doctor came face to face with injuries that reminded him of his time as a volunteer doctor in Syria, NBC News reported. Dr. Mounir Hakimi is a surgeon who lives in Britain. But he grew up in Syria and has returned to the Middle Eastern country regularly to help train doctors and carry out operations during its years-long civil war. "I never expected that I would be treating patients who have the same injuries that I saw in Syria," he told NBC News on Wednesday morning. "I never thought I would experience a terror attack so close to my house. I never thought it would be close to my family and my kids."